Much has been said about millennials, the segment of the population that typically falls in the 18-29 age range. Every aspect of their behavior, from their TV viewing habits and shopping preferences to home and workplace behavior, is constantly being scrutinized. With many applicants and new hires coming from this segment, companies are eager to know what makes millennials tick, what motivates them, and perhaps most important of all, what would make them stay with the company. To do this, we need to separate the facts from the myths, the conclusions from the assumptions, and confirm or debunk them as needed. 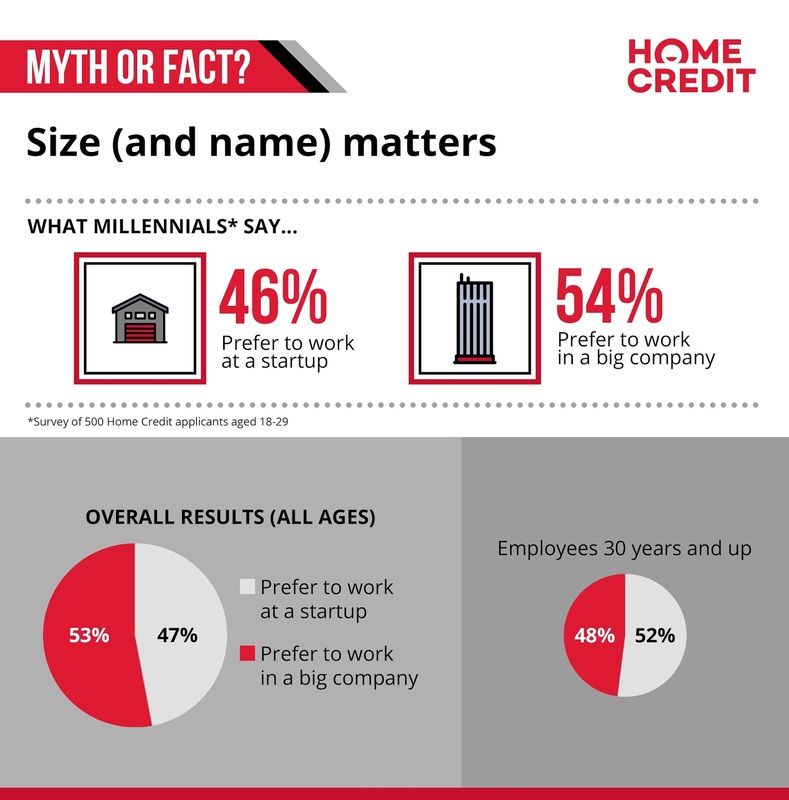 This is exactly what Prague-based fintech company Home Credit—itself an employer to more than 4,800 millennials, or 82% of the Home Credit PH workforce—did, as it recently surveyed close to 600 applicants about their career and workplace preferences. It is almost universally agreed by all Filipino workers, young and old, that traffic is no fun—and no good. But some say that millennials don’t mind a few hours of commute daily if it means working at a fast-paced business district, where all the action is (and where the top companies are). 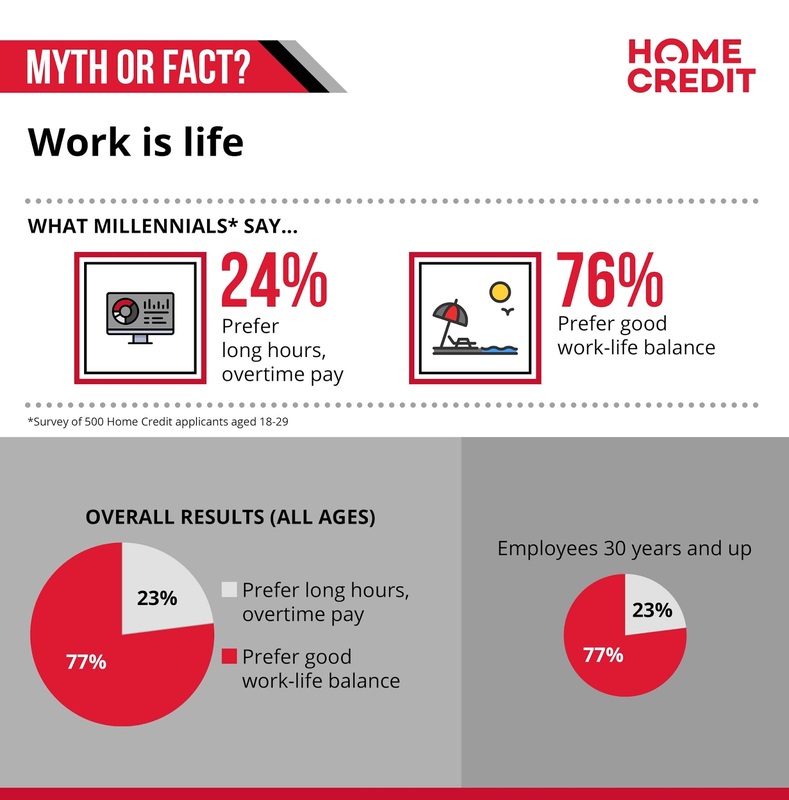 According to the Home Credit survey results, millennials are virtually split between preferring to work close to home (48%), or work in a top business district (52%). A similar split is seen in the 30-something segment, with 49% wanting their office to be near home. It’s no surprise that salary is a top consideration for employees, especially young ones, while older workers—many of which might have families to support—also want good benefits for their loved ones. 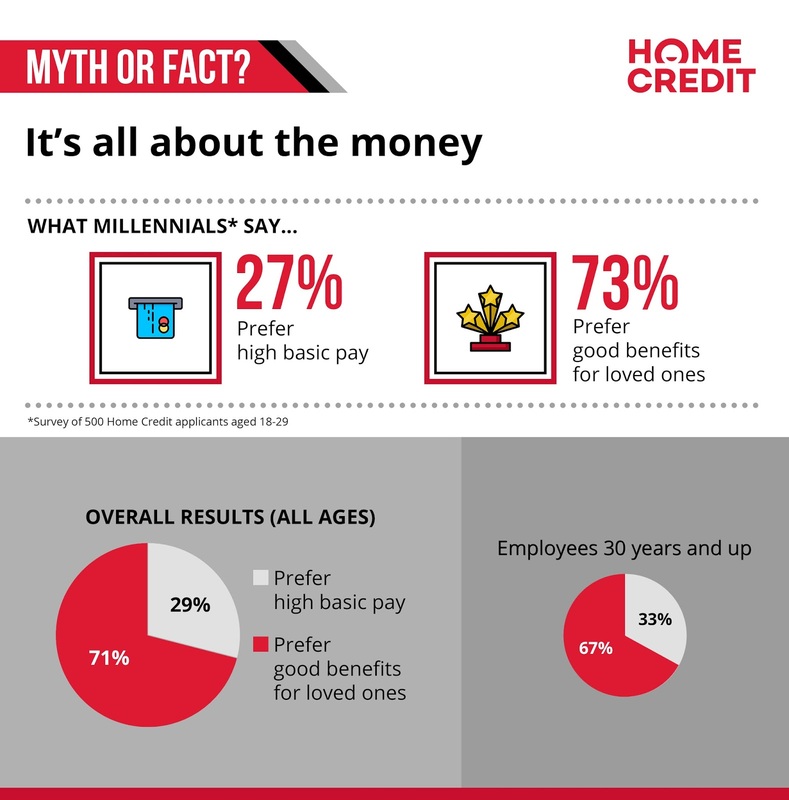 In fact, 67% of Home Credit’s 30 years old and above respondents chose having good benefits for their families over simply having a high basic salary. But what might be surprising is that an even higher percentage of millennials—73%-- chose good benefits for loved ones over high basic pay, possibly an indicator of Filipinos’ strong family-oriented culture, even among modern millennials. There are those who say that millennials are hooked on long work hours, especially those in creative-driven industries, while some say that young professionals are actually averse to overtime work, and want to have some “me” time after 6. But it seems that workaholics comprise a very small minority, as an overwhelming 76% of surveyed millennials put a premium on work-life balance, almost equal to the 77% preference rate of the 30-and-above group. Another seemingly obvious ‘fact’ is that employees care about the name or image of the company they work for. A big-name company is good, while a small, obscure company is not-so-good. Right? Not quite—while 54% of young respondents did say that they’d rather word for a big company than a start-up, 46% said that they prefer helping a start-up grow. The discrepancy is even smaller for thirtysomethings, with 48% preferring to work at a big company and 52% wanting to offer their services to a start-up. The last (and perhaps one of the most popular) myth/fact: millennials are prone to moving from one job or company to another. 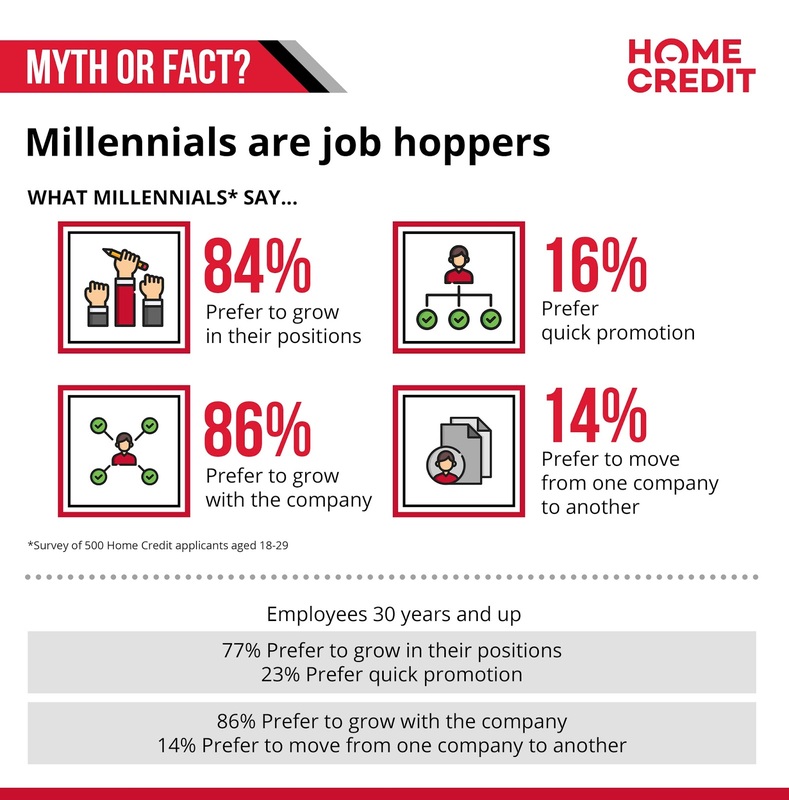 And while this is not uncommon, 86% of Home Credit’s millennial respondents said that they prefer to grow their careers in the same company—with the 30-and-above group having the exact same rate. Moreover, 84% of millennials said that they prefer to become specialists or experts in their field before moving up the ladder, while only 16% indicated that they prefer quick promotions. So what do you think, millennials? Do you agree with the results? Share your thoughts in the comments section!